I am not able to find words to describe today’s dessert. There is no adjective which can narrate the joy and happiness in a Bengali’s mind when you serve him this dessert at the end of the meal. I shouldn’t relate this to only Bengali. Indians from all parts are die-hard fan of this Bengali sweet. It’s the most common name after Rasagulla, in the list of sweet dishes in Indian restaurants. Yes, I am referring to Ras Malai (Rasmalai). 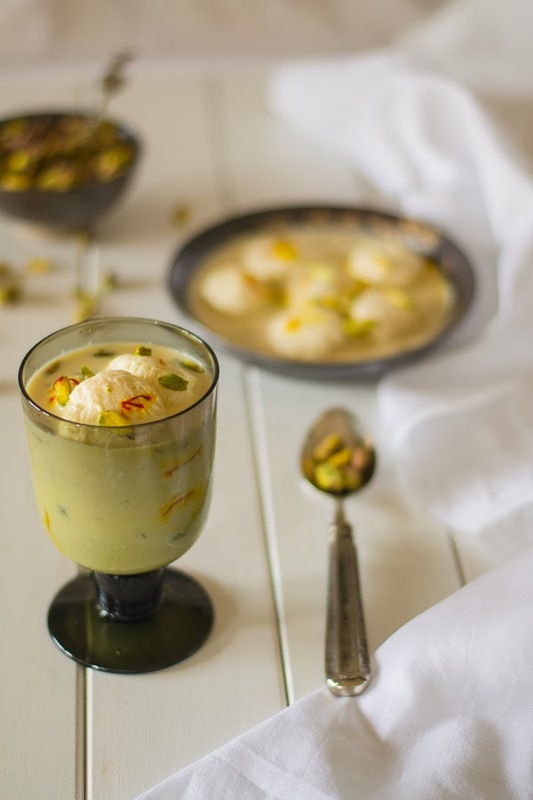 Ras Malai, the name consists of two words, Ras means juicy and Malai means Cream. It is milk-based dessert and made with cheese dumplings in cream syrup. 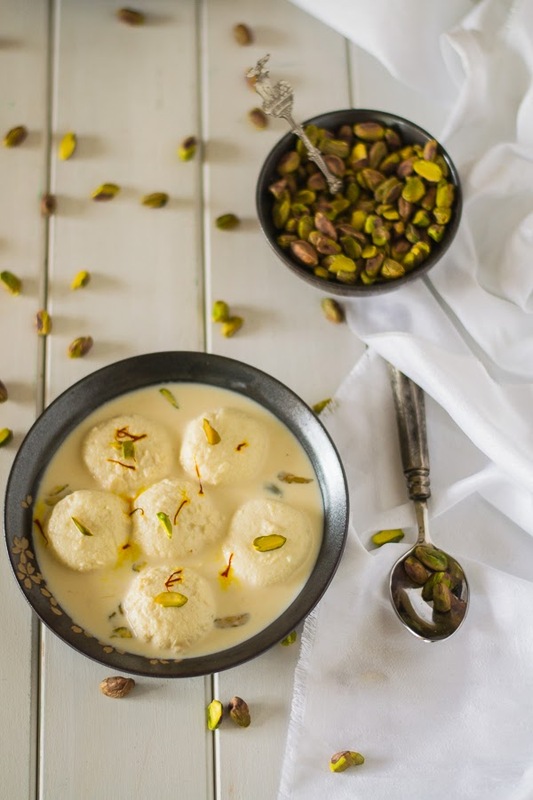 The cottage Cheese dumplings are soaked in sweetened, thickened milk and then are delicately flavored with cardamom and garnished with nuts. Ras Malai is my personal favorite too. When I was a kid, I didn't like to have dessert much. But this one was the exceptional to me. For some time, I had a plan to post the recipe of an Indian dessert, but did not get an excuse to make it. Since we try to avoid eating desserts, we rarely make sweets nowadays. Last weekend we invited some of my friends to dine with us and it gave us a chance to indulge ourselves too. 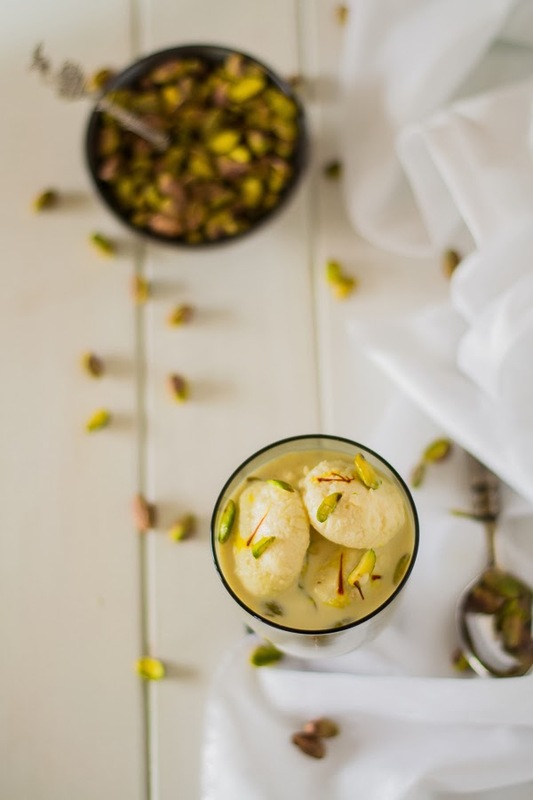 I learnt to make Ras Malai quite a while ago and I enjoy cooking this mouthwatering dish once in a year on a special occasion! Every time I would try some variant of the same dish. My readers probably can recall that few months back I posted another kind of Rasmalai recipe called Angoori Rasmalai( click here for angoori rasmalai ). 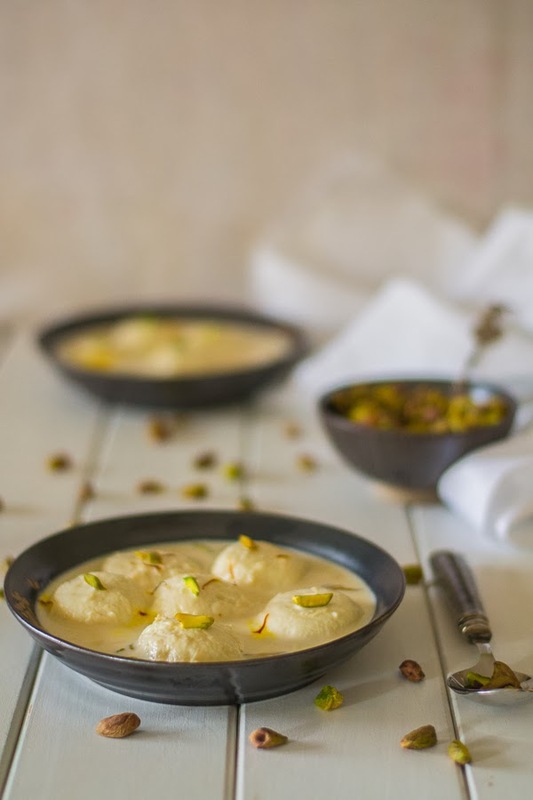 This time I came back here with the basic Ras Malai recipe and hope you will enjoy! 4. Put it over a soft cotton cloth / or a cheese cloth. Let all the water drain away. 5. Now put this cloth with the cottage cheese under cold running water for 2-3 minutes. This will help to remove the smell of lemon. 6. Hang the chhana along with the cloth on the kitchen tap / faucet for 45 minutes to 1 hr. 7. Now once again squeeze the cloth if there is any extra water. Try to get rid of as much water as possible but note that the chhana(cottage cheese) should not get too dry. 8. Now put the lump of chhana over flat surface. Add 1/2 tsp semolina, 1/2 tsp flour, 1 tsp sugar, cardamom powder into it. 9. Knead them nicely together. Press the dough with your palm continuously for about 3-4 minutes. Once you feel dough is oily then you are done. 10. Now from this dough make some round balls, approximately 16 to 18 rasgulla you can make with that dough. Gently press the balls to flatten them. 11. Take a big pan with lid. Add water and sugar to boil for some time. After 5 minutes, place the cottage-cheese balls into the syrup carefully. Cover it. Turn your stove on to a medium heat and let it cook. 12. After 25 minutes, open the lid to check. The rasgulla will be about one and half times of their original size and become spongy too. 13. Turn off the gas. Now remove the rasgulla from the syrup, gently squeeze out and keep aside. 14. In another pan, boil the one and half liters of milk at low flame, stir occasionally to prevent it from burning at the bottom. Once it becomes half in quantity, add sugar, add the cheese balls to the pan along with cardamom powder. 15. Let it simmer for couple of minutes, check the sweetness and turn off the gas. Add the saffron strands to the malai. Rasmalai is ready!! Serve cold with a sprinkling of chopped pistachios. 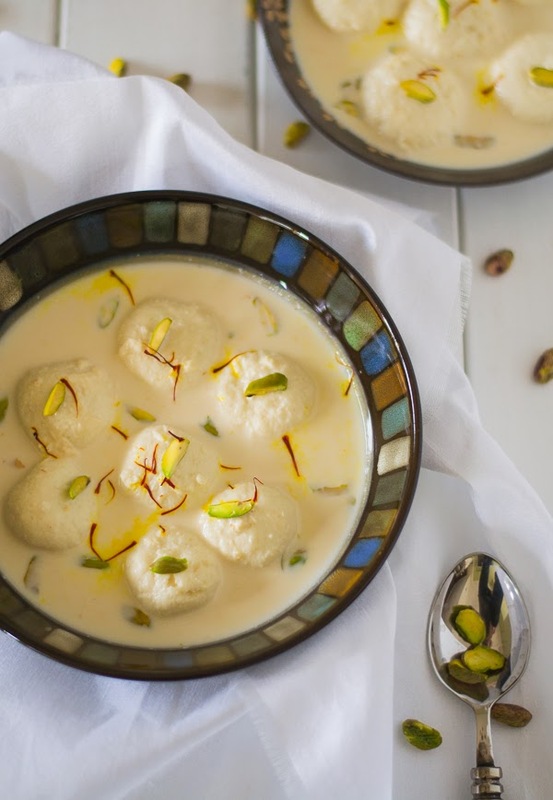 Note: Rasmalai is very delicate, you can store it maximum 2 to 3 days, preferably in refrigerator. Rasamalai looks so spongy soft and yummy! I made the Rasmalai by following your recipe. It came out well. But the Chhana dough was extremely sticky and difficult to handle. In fact , I did not get a dough like consistency. I,somehow managed to scoop it out and flatten it. What could be the reason? Sorry to know that, actually you should hang the chhena for few more minutes, there was extra water in it. This is the tricky part, try to get rid of as much water as possible.